These days, the books are being bought up by sellers of antique prints, who vandalise the books by cutting out the coloured pictures and selling them, mounted but not framed, for typically £120 per set of 6! This means that the sepia-and-white pictures (of the original Routledge editions), and the text, all get thrown away, and the buyers may not even know the poems on which the pictures are based. However, if you have a battered old copy which is falling to bits, don't throw it away because it could at least bring joy to someone's home in this form. 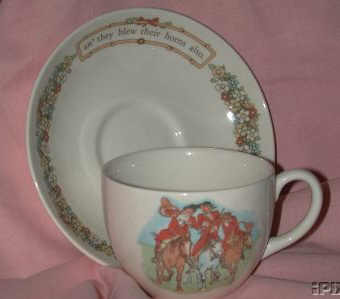 Items by, or about, Randolph Caldecott are often being offered for sale on the UK eBay: go to www.ebay.co.uk and use their "Search" facility to look for "Caldecott, R". This would probably not be a good place for rare items (see the prices in the list below), but is excellent for the more common ones, both for buyers and sellers. The opinion of Christie's, auctioneers of antiques, is that books by Randolph Caldecott are not "collectable". Of course, we don't agree! But by this they mean that the prices that they generally fetch would be too low for them to be included in their auctions. (Source: Christa Evans, Christie's, London, 13th Aug 2001.) Other works by him, however, would fetch higher prices. An interesting letter, signed by Caldecott and containing one or more original sketches, might be worth GB£100-150. Each of his oil paintings, for example, is unique, and should be worth GB£100's. His sculptures are even more rare: only 32 are known and listed in Engen's "Caldecott, Lord of the Nursery". So good examples should fetch still higher prices. We in the Randolph Caldecott Society can't advise on prices. As with all antiques, these depend both on the attractiveness and rarity of the item and the quality of the individual copy. However, here are some purchase prices which we have seen (in descending order of price: if list is not visible, click on each sub-heading below to show list). 'Twas the Fiddler Play'd it Wrong (oil painting, 1884, size 10in x 10in approx., exhibited Brasenose Club, No 57, 1888): offered for sale at Christie's, London, (circa 1995?) but failed to reach reserve price of GB£ 1,000. An original watercolour picture by Caldecott, exhibited & sold in a London Art gallery, Nov 2003 for GB£ 650. More "Graphic" Pictures (1887? but we don't know whether 1st edition or reprint), in good condition, complete, no foxing on plates: bought via www.ebay.com auction Jan 2003 for US$ 30. The Owls of Olynn Belfry (British edition, 1885? ): bought at Harrogate Bookfair, Oct 2002, GB£ 65. Breton Folk (an early but not first edition) bought via "BookWorld", Dec 2002, GB£ 60. Bookmark advertising the 16 Picture Books: an example was offered for sale on Abebooks.co.uk, ~Jan 2004, for GB£ 16 (Compare this with the books themselves!). For a picture of another copy of this, click here. Bracebridge Hall (undated edition publ. by Home Book Co., New York): sold on ebay.com, Jan 2005, for US$ 2.99 (about GB£1.66). What a bargain! 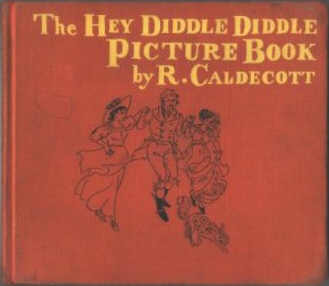 R. Caldecott's Picture Book No. 4 (Warne miniature edition, 1950's? ): sold on ebay.co.uk, Jan 2005, for GB£ 7.00. R. Caldecott's Picture Book No. 2 (Warne miniature edition, 1950's? ): sold on ebay.co.uk, Jan 2005, for GB£ 5.01. R. Caldecott's Collection of Pictures and Songs (Warne, early 1900's): sold on ebay.co.uk, Nov 2004, for GB£ 2.71. A bargain for eight Picture Books in one volume! For information about buying and prices of the various editions of this book, see our "Editions2" page: click here. If you have recently bought something by (or about) Caldecott, and are willing to tell us the price you paid, we will add to this list (omitting your name): please Email the details to us (for how to do this, see bottom of this page). 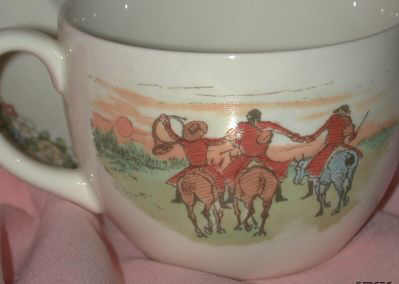 Wedgwood cup & saucer depicting two of Randolph's pictures from "The Three Jovial Huntsmen". Bought via ebay.co.uk, Jan 2003, for GB£4.40. Postcards: click our "Postcards" page. Advanced Book Exchange, Inc. Claims to be "the world's largest online marketplace for used, rare, and out-of-print books. Abebooks connects those who buy books with those who sell them, providing abundant selection at affordable prices." Our snapshot search for books by "Caldecott, R" produced well over 150 titles for sale in at least 3 Continents. Phone or email them for their extensive catalogue of children's books, usually including some of Randolph Caldecott's. They also buy such books. Specialist fields: Children's and antiquarian books. Heritage Centre, Whitchurch, Shropshire, England. Have individual prints from Caldecott's Picture Books for sale. For contact details etc, click here. Five Owls Books, Richmond, North Yorkshire, England. Were selling a Limited Issue of Prints made from etched plates of Caldecott's designs, to mark the 150th anniversary of his birth in 1996. Prices from £80 to £150 per print. Also had various related books for sale. J Dickinson, Chesterfield, Derbyshire, England. Sells sets of 6 colour prints from Caldecott's Picture Books. May be able to advise on prices. Acedia Booksearch, Hay-on-Wye, Hereford, England. Provide free worldwide Internet search of 20,000 booksellers for any book. Best contacted by phone. Shop: 46 Lion Street, Hay-on-Wye, Hereford, England. Bookmark (mail order only) - see our Postcards page, but they also sell Randolph's books. These dealers have been mentioned in the Newsgroup "rec.arts.books" as sometimes having Randolph's books in stock, or being able to search for them. When searching their website databases, use Caldecot* to allow for mis-spellings of the surname. For early editions, specify Publisher as Routledge but again you may need to try mis-spelt variations on this. www.Bibliocity.com small but the keyword searches all of the record. www.Bibliofind.com keywords seem to work pretty well. www.Abebooks.com try both Keyword and Publisher (it depends on how the individual dealer has set up his records).